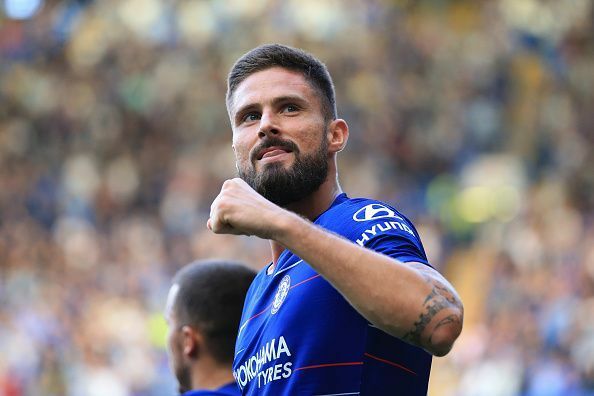 Olivier Giroud is a French professional football player who was born on 30 September 1986 in Chambéry, France.Currently, Giroud plays for French national team as well as Chelsea FC and his main role in the team is of a centre-forward. He is a hard-working striker who is also capable of playing in several other offensive positions. Known for his goal scoring rate and heading accuracy, Giroud can also hold up the ball for a long way to the goalpost. He can also be seen outwitting opponent defenders with his brisk run making ability. At the age of seven, Giroud joined his hometown club, Olympique Club de Froges to began his football career. After training with the club for six straight years, he moved to professional club Grenoble and joined its youth ranks. Between the years of 1999 and 2005, he played plenty of football as a young player for the Grenoble and performed well enough to get promoted to the senior team. He had scored 15 goals in the 15 games, playing for the reserve team of the club in the Championnat de France amateur 2. Giroud made his senior team debut on 27 March 2006 coming as a replacement in a Ligue 2 game against Gueugnon, which was ended up on a 1-1 draw. On 4 August 2006, in a 2-1 defeat against Niort, he made his first proper start playing for the whole 90 minutes. Giroud's first professional goal came on 26 February 2007, against Le Harve. In the late 2011, he received his maiden call up for the French national side and on 11 November 2011, he made his international debut in a friendly against United States. Match was ended up on a 1-0 win for France. On 29 February 2012, Giroud scored his first goal playing for the France in a friendly against Germany, in which France had won by 2-1. On 16 October 2012, Giroud headed a significant goal against Spain in a World Cup Qualifier. His goal has came in the very last moments of the match which helped his team to equalise the score. On 11 October 2013, he was named man of the match for scoring two fantastic goals in a friendly 6-0 victory over Australia. On 13 May 2014, current coach of the France, Didier Deschamps acquired him in the 2014 FIFA World Cup squad and he scored his first FIFA World Cup goal in the 17th minute of the very second group game against Switzerland. Although France lost to Portugal in the final of the EURO 2016, but Giroud was awarded the Bronze Boot of the tournament for finishing as the joint second highest scorer. In March 2017, he scored two back to back goals in a 2018 World Cup Qualifier against Luxembourg and won the game for his team by 3-1. Giroud's club career is way more successful than his international career. He played for the various clubs such as Grenoble, Istres, Tours, Montpellier earning a lot of fame and fan following. He had scored 33 goals playing 73 games for Montpellier between the years of 2010 and 2012. Having seen his splendid form, some prominent Champions League's clubs were desperate to sign him but Arsenal won the race signing a long-term contract with him. Giroud touched some new heights playing for the Arsenal and scored 105 goals in 253 games. Having him in the team, Arsenal won English FA Cup thrice in 2014, 2015 and 2017. They also won English Super Cup thrice in 2015, 2016 and 2018. On 31 January 2018, he moved to Chelsea FC ending his long-long career with Arsenal. Giroud has got 29 international goals in 69 games for the national team of France which also earned a place for him in the list of top ten goalscorer of all time for France. He has also scored a international hat-trick in a friendly against Paraguay.